As the COP23 UN climate talks open in Bonn, the European Commission and EU member states are embarking on a massive spending spree to subsidise new gas infrastructure that will make it impossible to achieve the global warming targets agreed two years ago in Paris, writes Pascoe Sabido. Pascoe Sabido is a climate policy researcher and campaigner at Corporate Europe Observatory, a Brussels-based NGO working to expose and challenge the privileged access and influence enjoyed by corporations and their lobby groups in EU policy-making. With deadly wildfires and ferocious hurricanes fresh in their minds, EU negotiators will head to Bonn next week for COP23, the latest round of UN climate talks. But the head of the delegation, EU Commissioner for Climate and Energy Miguel Arias Cañete, is working closely with industry to build a new generation of pipelines and other gas infrastructure. The European Commission, pushed by industry and supported by member states, plans to lock the continent into another 40 to 50 years of climate-damaging fossil fuel dependency. New research from Corporate Europe Observatory shows that the gas lobby is a force to be reckoned with in Brussels. Last year alone, gas corporations and their lobby groups spent over €100 million on influencing EU policy, with more than 1,000 lobbyists on their payroll. ExxonMobil and Shell, two of the planet’s biggest polluters, each spent €4.75 million on lobbying in 2016. By comparison, public interest groups lobbying against new gas infrastructure managed to mobilise just 3% of industry’s spending. Those numbers may explain why the gas industry enjoys such regular access to EU officials: in the last three years, its lobbyists had 460 meetings with the European Commission’s climate and energy bosses, Commissioner Cañete and Vice-President for Energy Union Maroš Šefčovič. The industry also spends its millions on hiring PR firms, whose marketing campaigns falsely present gas as a clean fossil fuel. The ‘natural’ gas they promote is made of methane, a greenhouse gas that is in fact over 100 times worse for the climate than CO2. On top of that, drilling for and transporting gas is accompanied by vast leaks into the atmosphere, making it as dangerous for the climate as coal, if not more. Regardless, the European Commission has bought the industry spin, and alongside member states is embarking on a massive spending spree to subsidise new gas infrastructure. This makes sense when you consider where it gets its advice from: ENTSO-G, the European Network for Transmission System Operators for Gas. The group, created through EU legislation, is made up of companies who build and operate gas pipelines and similar infrastructure, including Belgian Fluxys, Spanish Enagás and GRTgaz, a subsidiary of the French gas giant Engie. Many members are subsidiaries of big oil and gas companies. The EU has entrusted ENTSO-G to make projections for future gas demand in Europe and to propose the new pipelines and Liquified Natural Gas (LNG) terminals to meet it. The group consistently over-estimates future demand, which should come as no surprise given the core business of its members. Rather than suspecting a conflict of interest, the Commission and national governments provide political and often financial support to fast-track infrastructure projects proposed by ENTSO-G, labelling them as “Projects of Common Interest” (PCIs). Those projects considered to be “of common interest” are eligible for billions of euros under the EU’s investment programme. The latest list of PCIs is due to be finalised by the end of the year. But current EU gas plans don’t just threaten the climate, they also put local communities and environments on the line. One example is the Trans-Adriatic Pipeline (TAP), part of a mega-pipeline that would bring Azerbaijani gas to Italy via Greece and Albania. This PCI project has been met with resistance from local communities in each of the countries involved. In Azerbaijan, those attempting to denounce the project are faced with repression and jail. 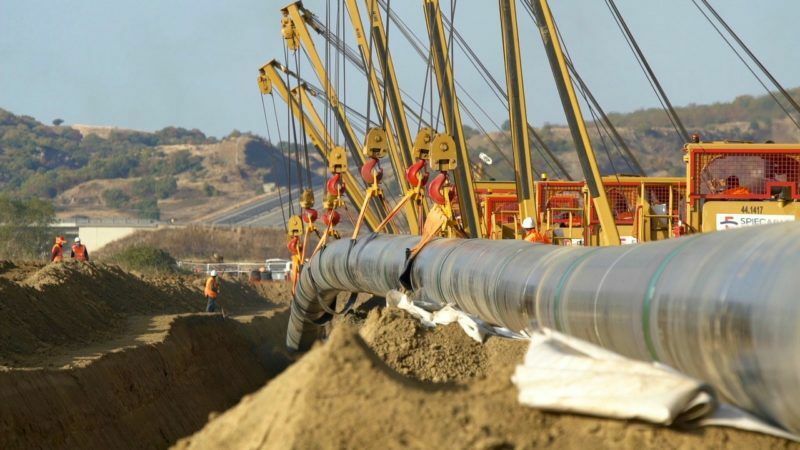 Despite this, TAP and other pipelines, like the controversial Franco-Spanish MidCat, receive high-level political support from the European Commission. The EU’s plans appear all the more absurd against the backdrop of an ever-decreasing gas demand in Europe. Compared to 2010, demand has shrunk b by 13%, while calculations by Food & Water Europe based on data from Gas Infrastructure Europe show that existing LNG infrastructure is operating at less than 25% of its total capacity. In other words, new gas infrastructure is not needed. As it stands, the EU Commission is committing Europe to an extremely expensive, utterly unnecessary and environmentally devastating energy infrastructure programme that has been dictated by the gas industry. If built, the “Projects of Common Interest” will make it impossible to achieve the targets agreed two years ago at the UN climate negotiations in Paris, as meagre as they are. We will not avert catastrophic climate change with the gas lobby and other big polluters dictating policy. Ahead of the climate talks in Bonn, several governments and civil society groups are urging the UN to keep the fossil fuel industry away from the negotiations, taking inspiration from the World Health Organisation’s stand against tobacco lobbying. The European Parliament has also joined the call. But EU Commissioner Cañete and his negotiators continue to block progress. Come COP23, will the Commissioner protect ex-business partners from his time as President of two oil companies, roles he held while also being a member of the Spanish parliament, or will he take a stand against the fossil fuel industry? What about the Greek revolutionary government? Doesn’t Mr Tsipras lend an ear to this critical issue or maybe he is too preocupied with keeping at pace with new coal investments in energy production through coal. What a same of a Young politician caricature.